Living rooms and work spaces are more unique than ever before. The expectation of functionality and comfort in furniture, furnishings and homes is steadily growing. The design of Interior lighting concepts thus plays a key role today; it dictates the mood and ambience of a room and thereby determines the quality of the overall design space. Hafele understands the needs of its customers and has put-together some contemporary home lighting concepts under the Ambient Lighting Brand; tailor-made to suit the specific requirements of individual homes and their residents. We at Hafele, put the important element of light planning at the center of a comprehensive collection of ideas. The practical, aesthetic and emotional aspects of lighting ensure that the proposed concepts contribute to the unique and flexible room design – in residential, commercial, office and display settings as well as in hotels and recreational spaces. LED lights have an extremely long service life of up to 25 years or more than 40,000 to 50,000 hours. LED’s have an extremely small and robust design. This makes handling easier during furniture construction and transport. LED lights use an impressive 90 percent less power than conventional light bulbs! This means that they can be used to implement modern lighting scenarios in furniture, and still be in line with the energy saving trend. Because of their extremely low power consumption, LED lights generate hardly any heat. 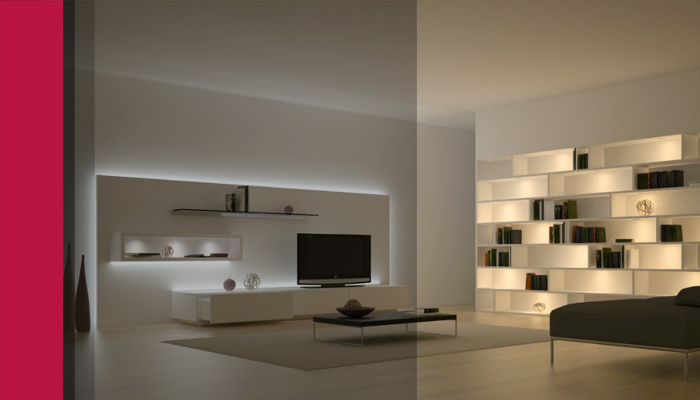 This means that LED lighting systems are particularly suitable for displays and furniture. Modern LED lights are brightand have a saturated light colour. They achieve full brightness instantly when they are switched on. LED furniture lighting therefore has a lasting effect at the push of a button. LED lights are available in different colours, and can be designed as colour changing lights. This allows the light colour to be coordinated with furniture contents such as exhibits in the best possible way.